Welcome back to another issue of Milk Bar Mornings, a weekly block where we analyze songs for their story and technicalities. Since it is so cold outside here, I thought there would be no better way to get nice and warm than listening to themes for some of the hottest places in the series, the fire dungeons. Fire dungeons have played a major role in the series, appearing in nearly every game in the series. The dungeons often include fire bursting out of the ground and shaky bridges over pit of lava. Numerous games in the series have featured these dungeons in Death Mountain, a mountain that occasionally is portrayed as an active volcano. So let’s hit the jump to see what dungeons we will be looking at today! Dodongo’s Cavern is the first 3-D fire themed dungeon ever in the series. 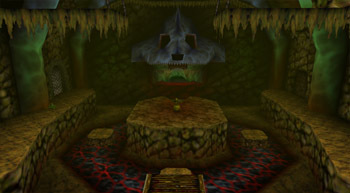 The cavern is the second dungeon Link faces in Ocarina of Time, where he must kill the evil inside so that the Gorons can enter again, and so he can be rewarded with the Goron Ruby. The music played in the background when exploring the cavern, is more of a soundscape, the sound of many things echoing through the caverns heard occasionally behind the deep moan of the cave. Together, it creates a creepy piece that when heard alone, sounds like nightmare fuel. The story presented in this soundscape is a story of control. The cavern, once the food source for the Gorons, has been taken over by Dodongos, and blocked off, letting the evil inside marinate. When Link enters, it is clear he is in someone else’s territory. The sounds of movement echoing through out the cavern gives Link the feeling that he is being watched by those who control the cavern, yet he must go on, to take it all to himself, so he can hand it over to the Gorons. The deep moan of the cave is not it striking fear into Link, but rather it moaning for help, hoping that it could be free under the Goron’s control. The Fire Sanctuary is the second fire dungeon Link visits in Skyward Sword. The Fire Sanctuary is located deep in the summit of Eldin Volcano. Here Link must venture through to find Din’s Flame, one of the three sacred flames needed to temper the Goddess Sword turning it into the all-powerful Master Sword. The theme for the dungeon, like all songs in the game, is orchestrated, featuring many Mediterranean instruments. Drums, bells, horns, a marimba, and various string instruments are used, all played together to create a mediterranean-style piece. The song holds a story of trial. Link finally faces the task of getting the final sacred flame, so that he can power up the Goddess Sword, but to do so, he must venture through the heat of the Fire Sanctuary. The drums, horns, and some strings, play the role of giving the beat. The beat follows a stealthy sound, almost as if it is reminding Link that he can’t stop what he has been doing, and must continue on briskly to get the final flame. A combination of Middle-Eastern string instruments are used for the melody, creating a desert-like sound, enforcing the fact that Link is venturing through a place built on heat. Finally the marimba comes in with a bell, creating a sound that is cave like, living up to the fact that the player is venturing through the summit of a volcano. Together this creates a tune that holds the heat of the trial Link must face. For the last piece we will be analyzing, we will be looking at the other fire dungeon located in Ocarina of Time, the Fire Temple. 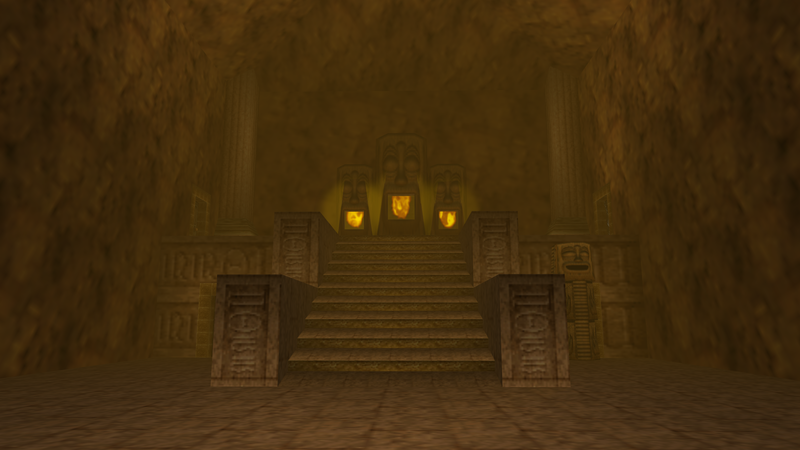 The Fire Temple is the second dungeon Link must venture through to awaken one of the sages. Here Link must save Gorons who had been locked away by Ganondorf (due to their disobedience towards him) before finally killing the beast inside, and awakening the Sage of Fire. The temple is located inside Death Mountain, a live volcano towering over Kakariko Village. 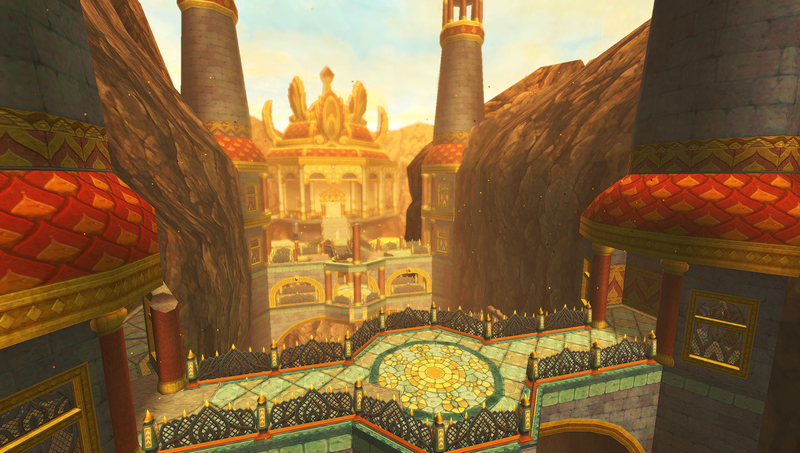 The theme for the temple features the echo present in many dungeon themes of the game, and the sound of drums, bells, and the moans of people within, topped off with the sound of wind blowing. The story present in this theme is a story of unfairness. The Gorons, a happy, loving tribe had been stripped away from their home, and locked up in a temple hidden away in an active volcano, simply for having self-respect for themselves. The sound of the moans and singing of people represents two things. The men singing such deep notes, almost of beat, holds a message of rebellion. The Gorons rebelled against Ganondorf, and were thrown in here, yet they hold strong. Meanwhile the sound of women singing the melody holds the fear that is truly held up within them, and the fear that the player must overcome to manage his way through the temple. The drums and bells create a beat, one that can be danced to. This supports the fire in the temple, acting like a beat to the dancing flames. Finally, the echoey sounds of fire and lava flows through out, showing the darkness within. Together this shows the unfairness given to the Gorons. But that is all for this issue of Milk Bar Mornings! What did you think of this issue? Loved it? Hated it? Let me know in the comments below. Also, let me know what you want next weeks theme to be in the comments. Thanks for reading!